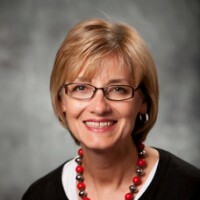 Rolaine Hetherington has been at Friends University since 1993, first as an adjunct professor and as a full-time professor since 2011. Hetherington teaches studio voice, directs the Concert Choir, codirects the Chamber Choir, and coproduces the music theatre and opera productions. She has taught at a public school level and held positions at William Penn College in Iowa, and North Central Bible College and Crown College in Minnesota. She was the recipient of a Rotary International Scholarship to study lieder and oratorio in Austria. She has performed with the North Star Opera Company (Minn.), Dale Warland Singers, Bach Society of Minnesota, Minneapolis’ Children’s Theatre, Oregon Bach Festival, Wichita Chamber Chorale, Music Theatre of Wichita and numerous regional choirs throughout the Midwest. The Concert Choir tours every other year and travels primarily regionally and in state. They have also had the privilege of performing at the Kansas Music Educators Association’s winter conference. She holds certificates of completion from Hochschule fϋr Musik und darstellende Kunst Graz in Austria.